The market posted modest losses this truncated week, breaking the uptrend after rallying for the previous three weeks. Sensex and Nifty were down 1.34 per cent, and 1.46 per cent respectively. 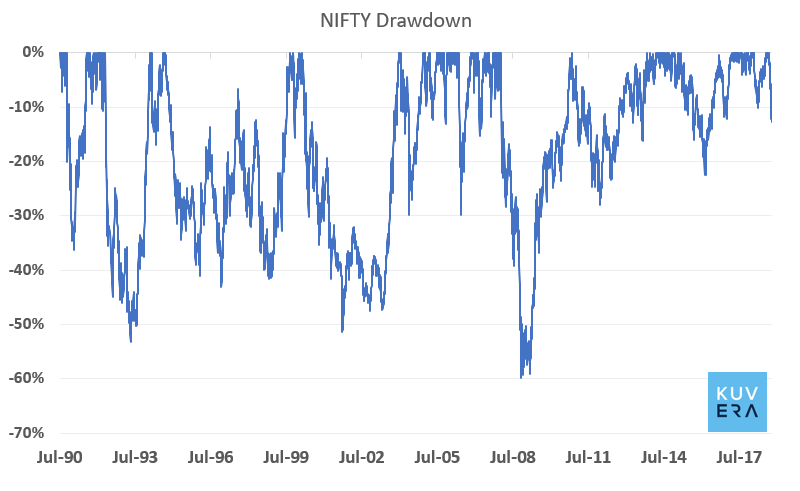 Just a reminder, over the past 28 years going back to 1990, Nifty has had a 10% or more decline every 14-16 month. Nifty is currently down ~11% from its peak. A 10% or more decline has been a good time to invest for the long term, i.e for 5 – 10 years. 1/ Indiabulls Mutual Fund has launched an NFO for Indiabulls Dynamic Bond Fund. This open-ended scheme will invest in debt securities of various durations. 2/ Indiabulls Mutual Fund has launched an NFO for Indiabulls Equity Hybrid Fund. This open ended scheme will be managed by Malay Shah, Sumit Bhatnagar and Veekesh Gandhi.